Providence Preservation Society’s award-winning Winter Bash theme party takes place Saturday, March 3 from 8 p.m.-12 a.m. at ALCO, 317 Iron Horse Way. This year’s event, entitled Glitz & Glamour: A Speakeasy Affair, is hosted by Alex and Ani. The Bash was named both “Best Local Event-Providence” and “Best Nonprofit Fundraiser-Statewide” by Rhode Island Monthly in 2017. This is definitely a “not to miss” event for 2018. Feel free to dress in your best 1920’s attire or come as comfortable as you would like! Entertainment for the evening includes performances by Miss Katie Kleyla & The Italians and Providence Swings; DJ entertainment by All That Events; photo booth fun by WRIK Entertainment and vintage photo opps by Suite Tarte Pin-Up. In addition, there will be complimentary bites from local restaurants and vendors. There will be a cash bar, with proceeds benefiting PPS, serving cocktails all evening. General admission tickets are $55 in advance at ppsri.org/bash or $65 at the door. Purchase any ticket now through Saturday and win a chance at a stay at The Dean Hotel! VIP ticket-holders receive entrée into a private speakeasy lounge presented by Uniquely Chic Vintage Rentals, featuring bottomless bubbles by Bottles plus decadent hors d’oeuvres and tastings. Feel like you have stepped back in time to experience the grandeur of the 1920’s while enjoying the great party! VIP tickets are $110 available in advance at ppsri.org/bash or $125 at the door. Now in its 15th year, the Bash showcases the potential in historic city buildings and supports the PPS mission to improve Providence through preservation and thoughtful design and planning. 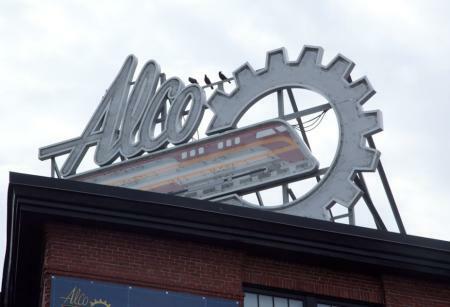 The 2018 venue, ALCO, was once home to such Industrial Era-giants as Rhode Island Locomotive Works, American Locomotive Works and US Rubber. The period-appropriate event will be held in the final section of ALCO to be rehabilitated as commercial space by The Foundry Associates. Plan to spend the night in Providence at one of the area hotels, grab dinner and dance the night away at Rhode Island’s best party of the year!